Garlic & tomatoes make happy partners, especially in soups and sauces. 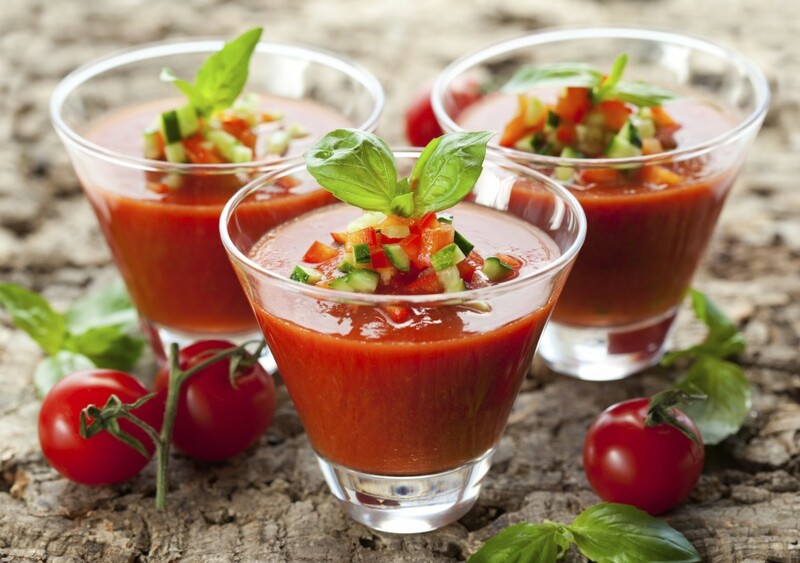 Gazpacho is a veritable salad and vinaigrette - in a soup bowl. In this recipe, like everything else, the garlic is uncooked. Combine tomatoes, garlic, almonds, half of the cucumber and 1/2 cup of the onion in the bowl of a food processor fitted with the metal blade. Pulse until mixture is finely pureed. Pour into a large bowl. Whisk in chicken stock, sugar, salt, garlic steak sauce and pepper. Blend well then vigorously whisk in olive oil,vinegar and half of the cilantro. Taste and adjust seasoning. Chill at least 4 hours. Just before serving, adjust seasonings again. Ladle soup into serving bowls. Sprinkle with cilantro and remaining cucumber and onions. Green onions optional for garnish. NOTE: For this assertive soup, a sharp, fresh, green garlic flavour works best.